As a 2015 Guggenheim Fellow, English professor Benjamin Reiss will spend the next academic year working on a cultural and literary study of modern sleep patterns. 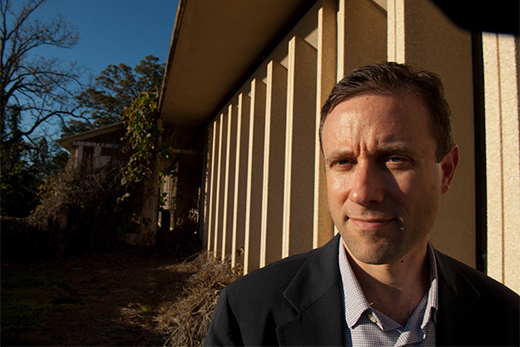 As a winner of the prestigious Guggenheim Fellowship for 2015, Emory English professor Benjamin Reiss will spend the 2015–2016 academic year working on his third book, a cultural and literary study of modern sleep and its almost-obsessive management by society and the medical profession. Reiss's Guggenheim project is "Thoreau's Bed: How Sleep Became a Problem in the Modern World," a book whose idea germinated in a course Reiss co-taught with Emory neurologist David Rye on "Sleep in Science and Culture." The book "asks how sleep became a nightly ordeal in need of micromanagement, medical attention and pervasive worry." In his Guggenheim proposal, Reiss states, "Far from a simple biological constant, sleep actually is one of the most rule-bound and tightly regimented activities of our society — and yet the rules we adhere to (sleep in one unbroken stretch for roughly eight hours; do so in a private, sealed room with at most one other consenting adult; train your children to sleep alone through the night from a very young age) seem particularly maladaptive to the waking worlds we inhabit." Reiss is among 173 Guggenheim Fellows named this year by the John Simon Guggenheim Memorial Foundation; winners were chosen on the basis of "prior achievement and exceptional promise" out of more than 3,100 applicants. "These artists and writers, scholars and scientists, represent the best of the best," says Edward Hirsch, president of the foundation. "Since 1925, the Guggenheim Foundation has always bet everything on the individual, and we're thrilled to continue the tradition with this wonderfully talented and diverse group. It's an honor to be able to support these individuals to do the work they were meant to do." Reiss says his research for his first two books, "The Showman and the Slave: Race, Death, and Memory in Barnum's America" and "Theaters of Madness: Insane Asylums and Nineteenth-Century American Culture," led him to his current project. "Each project grows out of the ones before it, and my new project came about when I was working on my book on insane asylums in American culture. I noticed that the superintendents of these asylums were obsessed with sleep — controlling and monitoring the sleep of patients — and if unruly patients were up at the wrong hours, they were restrained and put on sedatives," he says. While writing a paper on the case of young woman who was institutionalized due to sleepwalking, Reiss says he began formulating the idea for his current project. "As I was writing that piece it occurred to me that a whole side of human history has been left out of the picture -- what happens when we shut the lights and go to sleep," he says. "There is one-third of human life that really hasn't been given historical treatment." After teaching the course with Rye, Reiss also became interested in "how sleep became a medical issue that has to be regularized and normalized." "It is interesting that we have a standard way of sleeping — all in one shot at night — and if you can't do it that way and you can't learn to do it from young age, there is something wrong with you," Reiss says. "Historically that is a very weird phenomenon. It is a strange expectation to bring to sleep and there were very few cultures that expected anything so rigid before the nineteenth century." This pattern, which he theorizes likely corresponds with industrialization, changing work patterns, the rise of electric lighting, the institution of compulsory schooling for children, the spread of caffeine and other stimulants, the rise of medical and scientific specialization, and changing notions of psychological development, has led to modern concepts of "normal" sleep. "No matter what season or body type you are, there is sort of one routine with sleep, and if you can't get on that routine, it is something that needs treatment. To me that is the central question: 'How did that happen?'" Reiss says. While teaching a course on Thoreau's "Walden," Reiss says he realized the book was "a rich record of sleeping and waking." "Part of what he was witnessing was the birth of the modern world and he was recording how that affected people's rhythms." "Thoreau's Bed" is scheduled to be published in 2017, the 200th anniversary of Thoreau's birth.